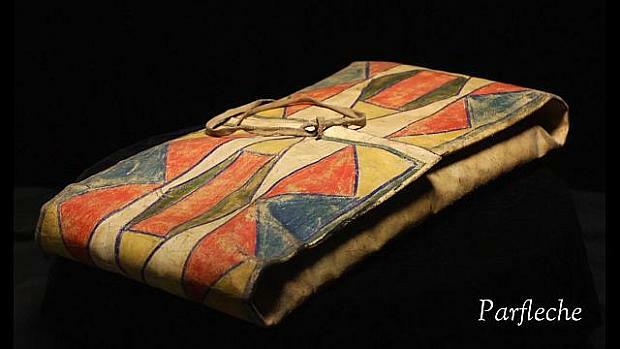 The parfleche bags are made out of rawhide and would be called a suitcase if being described in modern language. The rawhide was folded while wet so it would keep its shape. The bags were used to pack belongings while traveling. Some bags were used to carry food, and bigger bags were more like family bags that were placed on the back ends of saddles and strapped down but still accessible without having to be removed from the horse. Some bags were used like a ladies purse. Some of the decorations on the bags had meanings that were the creation of the artists.